If these Christmas dogs don’t get you into the holiday spirit, well… then your heart may be made of coal. Hope you enjoy our images, wishes and funny dog Christmas memes. Our furry friends got into the Christmas spirit now! This dog is gonna take a prime spot on Santa’s sleigh! While “Turkey Day” might be dogs’ favorite holiday, they also love getting in the Christmas spirit. If you love dogs and X-mas as much as we do, it doesn’t get any better …. What´s your favorite dog Christmas movie this year? Nothing makes a movie better than having a really cute dog as the star. These Christmas dogs and cats help your heart grow three sizes and remind you of the true reason for the season: loveable, huggable, snuggleable pets! Dear Santa, for Christmas please bring me some new squeaky toys and treats. Watching this puppy dreams come true will get you right into the holiday spirit. Looking for the perfect dog toy this Christmas? What’s more fun than chasing squirrels at home? Pulling the squirrels out, running around, chewing, and fetch…. This will be truly your dogs favorite toy. 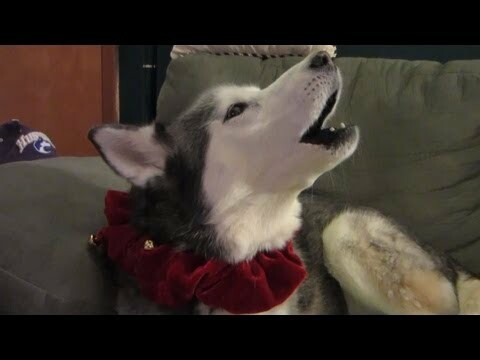 Have fun listening to these Husky dogs … barking, singing Christmas songs! This little dog will “fa-la-la” right into your heart. Hope you like our cute dog Christmas meme. Feel the festive holiday spirit coming on? This dogs certainly does. Looking for a cute dog sweater this holiday season? Hang your stockings and say your prayers.